The cost to attend the 32nd Annual FISSEA Conference is $138.00. The attendee fee includes continental breakfast and a PM coffee break both days. 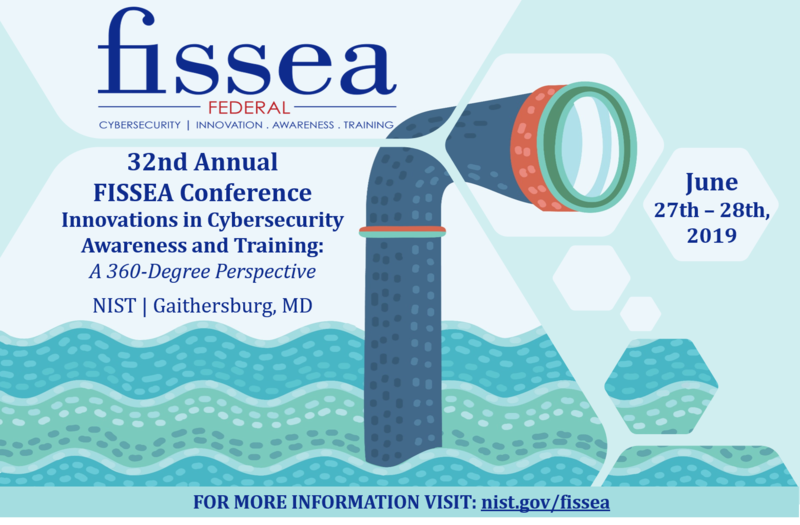 FISSEA is a forum for Federal Information Security Educators to share information, effective practices, and solutions regarding cybersecurity awareness, training, and industry-recognized certifications for the federal cybersecurity workforce. The 32nd Annual Conference will be held on June 27th and 28th, 2019 at the National Institute of Standards and Technology (NIST) in Gaithersburg, Maryland. The Conference theme is Innovations in Cybersecurity Awareness and Training: A 360 Degree Perspective. Creating a cybersecurity training and education baseline that establishes minimum practices to reduce vulnerabilities. Creating effective, meaningful, and impactful security training using available resources. The opportunity to connect, learn, share, and network with other security professionals and thought leaders in industry, academia, and government. Track 1: Building Innovative Approaches to Awareness Programs How do you build an effective cybersecurity awareness program? Now is the time to provide specifics -- what exactly is an innovative awareness program? We are looking for presentations on how your organization’s cybersecurity culture changed; institutionalizing information security into the organization’s mindset through a comprehensive awareness program (not an hour a year) – come tell us what innovations you are doing to champion and lead this transformation. In this track, we are looking for presentations that raise the bar for cybersecurity awareness programs, products, events, and activities. Track 2: Developing Skills through Innovative Role-Based Training How do you address individual training requirements when individuals perform multiple roles? Is it the content, the instructor, the student interaction, the delivery medium, or the location that has the most influence on training acceptance? What factors make the most difference in learner acceptance and transference? In this track, share your innovations with the FISSEA community and make a difference in shaping the behaviors of the federal cybersecurity workforce. Track 3: Implementing Comprehensive Awareness and Training Programs How are you using awareness and training to engage all employees at your organization? How have you built a comprehensive awareness and training program that includes managers, executives, technical, nontechnical staff? How do you ensure employees know their cybersecurity responsibilities and how they contribute to risk reduction? How do you measure performance and demonstrate benefits? In this track, we are looking for presentations that help to answer and address these questions. The Federal Business Council (FBC) hosts an exhibition with table top displays which includes an exhibitor fee. The Exhibitor Showcase provides an opportunity for government agencies, institutions of higher education, and private sector or non-profit organizations to showcase products and services. Organizations can share general services, highlight projects and initiatives, and other information for the purpose of creating awareness about their capabilities. Exhibitors should contact the FBC directly to make arrangements. To participate in the exhibitor showcase, click HERE. To participate in the exhibitor showcase as a government agency, contact Eric Longo at eric@fbcinc.com to register. Government agencies are NOT charged a fee to participate during this exhibition, but they still need to register their participation with the FBC. Rates from $119/night. Book by June 5th to reserve your room!